Come experience the joy of making music! Music Adventures is a child-centered, age-appropriate program that allows children to actively participate in the art of making music. 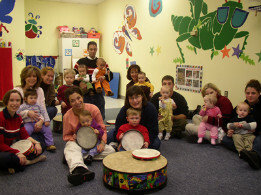 A carefully sequenced curriculum introduces children to a wide variety of musical sounds, styles, and tonalities in a fun and engaging class environment. Family Packets contain a wealth of information about the musical content of each class, so parents can continue the music learning at home.